The popular helmet awareness campaign Riders4Helmets announces the winners of the 2012 Craig Ferrell MD Equestrian Safety Awards. The winners are excellent representation of equestrians from all over the world. Award winners include: Charlotte Dujardin, Allison Springer, Lucinda Green, Isabell Werth, Reed Kessler, Adelinde Cornelissen, Courtney King-Dye, Jacqueline Brooks, Adrienne Lyle, Kathy Slack, Megan Sparks, Tammy Sronce, Elisa Wallace, Laura Backus, Mary Miller Jordan, Scot Hansen, Meg Wade, Elizabeth Charleston and Jon Pitts. The awards, which are named after the late USET Physician and Chair of the FEI Medical Council Craig Ferrell MD, who tragically passed away in May 2012, was designed to recognize individuals who were exceptional role models for helmet wearing, or equestrian safety. Winners were selected on the basis of number of nominations received and supporting reasons for nomination. Mrs. Lorraine Ferrell was in attendance at the 4th Riders4Helmets Safety Symposium, held Saturday February 4th in Lexington, Kentucky. Several of the winners were presented with their silver platter award, by International Event Rider Allison Springer. 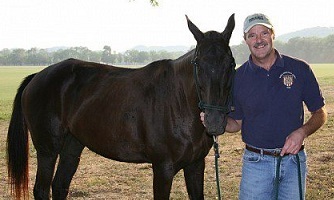 The winners of the 2012 Craig Ferrell MD Equestrian Safety Awards are listed below. Charlotte Dujardin made history at the London 2012 Olympics by not only setting a new World Record for the Olympic Grand Prix Special but also for winning double gold medals; all while wearing a helmet. While luck was on Charlotte’s side the day of her accident and she recovered fully, the same might not be true for the next aspiring rider who falls while not wearing a helmet. When Charlotte won her Olympic Gold Medals while wearing a Charles Owen helmet – the first ever to do so – she didn’t just win medals, she won the status of role model. Charlotte’s influence as a role model might someday convince another rider to wear her helmet and as a result possible save her life. Robert K. Merton first coined the term ‘role model’ in 1957 and since then countless people have been labeled role models. A role model is generally known as a person who serves as an example and whose behavior others emulate. In the equestrian world, riders might be labeled role models due to their tenacity, perseverance, riding skills, and accomplishments. Allison Springer possesses all of those traits, but she also has the honor of being called a role model for her stand on safety. 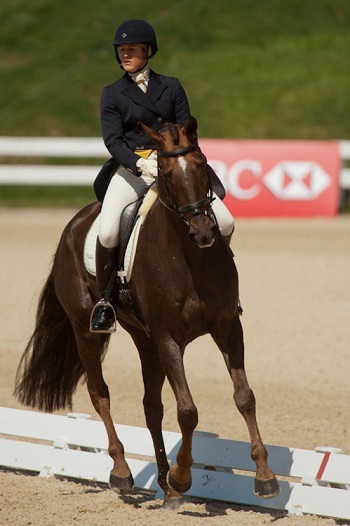 In 2010, Allison became the first rider at the Rolex Kentucky CCI4*, to wear a helmet in the dressage phase. A year later 15 other pairs followed her lead and wore helmets. The trend has continued thanks to Allison having the courage to break the helmet barrier. Leading the charge to wear helmets in dressage makes Allison a great role model for the next generation of riders. In 2012, Dutch Dressage Rider Adelinde Cornelissen wore a helmet when she won the FEI World Cup Qualifier in Lyon (November); placed 2nd in the World Dressage Masters Grand Prix and won the World Dressage Masters Grand Prix Freestyle in Mechelen (December). Back in June 2010, Canadian Jacqueline Brooks, emailed us the following message of support, “I would like my name to be added to the list of FEI riders & Olympians who support your cause. I have been wearing my helmet in International Dressage Competitions since March 2010. In the Palm Beach Derby in Fl I was the only one to compete in a helmet. Seven CDI’s later there were seven FEI riders in helmets & four of the top six had left their top hats at home! Keep up the good work, change is on its way.” Change was indeed on its way. Kathy Slack is a former trauma nurse who knows only too well the damage that not wearing a helmet can do. Eight years ago Kathy was the only professional competitor to wear a helmet within the United States Team Penning Association and persisted through the comments, the stares, and the nickname “helmet head” to become one of the most successful riders in the organization. Kathy has continued to wear a helmet ever since. Kathy started the Western Helmet Project in order to educate competitors at major western competitions on the benefits of helmets and has purchased helmets out of her own pocket in order to ensure that youth western riders protect their brains. The 14 year-old barrel racer Megan Sparks from Ohio started riding at the age of 3. Sparks rode English/Hunter Jumper then switched disciplines to running barrels at the age of 8. She is currently in 8th grade training with Ty Mitchell and the team at the Josey Ranch. In 2012 alone, Megan racked up an impressive list of accomplishments including: 2012 IBRA National Finals, 7th in 1D Open 2nd Go out of 500+ entries; 2012 IBRA National Finals, 2nd in 1D Youth Long Go out of 250 entries; 2012 Josey Jr. World Top 5 1D Finalist; 2012 Josey Jr. World 1D, First Go Champion out of 540 entries; and 2012 AQHA Youth World Qualifier (placed 6th in qualifying round). What was perhaps even more impressive was that Megan wore a helmet to compete at every single event. World and National Mounted Cowgirl Shooting Champion, Tammy Sronce, attended the 3rd Riders4Helmets Safety Symposium in 2011, at which she made a life changing decision to always wear a helmet after watching 2008 Olympian Courtney King-Dye’s presentation. Elisa Wallace was the first Event rider to compete in an Extreme Mustang Makeover and gained national attention in 2012 for her efforts with her Mustang Fledge. Not only that, but she was the only competitor to ride with a helmet in a western dominated arena and won the North Carolina Extreme Mustang Makeover in October 2012 while proudly donning her helmet. Some would say a cowgirl simply isn’t a cowgirl without her hat, but one cowgirl has discovered there’s something even more near and dear to her heart. Despite competing at the National level in Western competitions where a cowboy hat is the norm, Mary Miller Jordan made the decision to start wearing a helmet, following the birth of her daughter Filleigh Kay two years ago. In March 2008, Olympian Courtney King-Dye will be three years down the road from the riding accident that left her with a traumatic brain injury. Courtney still continues to undergo rehabilitation, although insurance company restrictions and finances limit this. In 2011, Courtney made the decision to not let her accident be labeled a tragedy and formed a partnership with riders4helmets in order to educate equestrians on helmets. To date, Courtney’s first video produced for the riders4helmets campaign has received over 60,000 views on YouTube. In 2012, Courtney attended the 3rd riders4helmets safety symposium and when she stood up to share the story of her daily struggles, there was barely a dry eye in the room. In July 2012, Courtney produced another video for Riders4Helmets in order to promote International Helmet Awareness Day and participated in countless interviews in order to ensure that her story continued to be heard. In November 2012, Courtney was awarded the FEI Against All Odds Award. Courtney continues to be an ambassador for the global education of the benefits of wearing a properly fitting and secured, certified helmet. Meg Wade is the only person to have won, four times, the Southern Hemisphere’s premier 100-mile (160 km) endurance race, the Tom Quilty Gold Cup. On Easter Sunday, 2009, while competing in a 100 kilometer ride at Tumbarumba she was thrown from her horse and was critically injured with a fractured skull. She was subsequently airlifted to Canberra Hospital in a coma. Although she eventually regained consciousness, she spent nine months in Epworth Hospital in Melbourne recovering from Acquired Brain Injury. In 2011, Meg was the recipient of the FEI “Against All Odds” award. Elizabeth Charleston is proof that one small voice can make a difference in society to help other people. Throughout 2012 Elizabeth has pushed for acceptance of safety riding helmets in every way that she could amongst the equestrian codes with her various roles and jobs that she does including being an organizer at the NZ Horse of the Year Show where she created a new ruling that all adults competing in the Debutante Horse titles had to wear a 3 point harness safety helmet. No safety helmet – no start. Simple as that. A couple of years ago Elizabeth came up with the concept of awarding a prize to the highest placed competitor in a formal equitation turnout event that was wearing a 3 harness safety helmet. Traditionally a bowler hat is required for ladies in this type of showing event that is judged on the rider’s formal (hunting) turnout, riding ability, conformation of the horse and the performance in the work out. To challenge tradition was a big call as this went against the norm but thankfully some brave competitors took up the challenge at the various shows that held the awards. As a result of Elizabeth’s work in the past few years we now see a big increase in the amount of showing riders wearing safety riding helmets instead of bowler and top hats in the show ring as well as in dressage competitions where it is now becoming the ‘norm’ to wear proper protective head gear. During 2012 Elizabeth donated ‘THINK! Head Injury Awareness Awards’ at the following equestrian events in New Zealand: NZ Horse of the Year Show (March 2012); Royal New Zealand Show (October 2012); and the South Island Premier Showing Championships (December 2012).